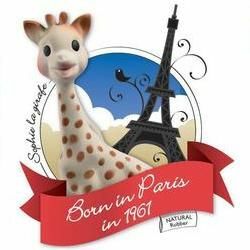 This little giraffe was born on 25th May in the year 1961...Saint Sophie's day! By simple word of mouth, the little giraffe's fame spread. From then on in Europe, generations upon generation of children were to love hearing Sophie squeak whenever they pressed her tummy or head!